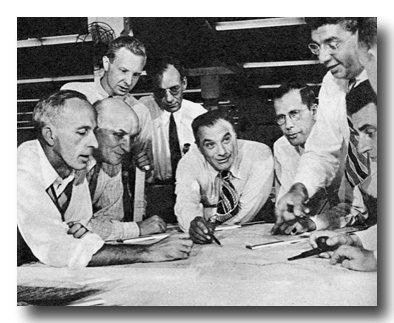 Republic Aviation Corporation was established in 1939 when the board of directors of Seversky Aircraft ousted Alexander de Seversky as company president because of mounting losses and changed the company's name to Republic. W. Wallace Kellett became the new company president. One of the last planes produced by Seversky aircraft had been the AP-4, an adaptation of the P-35, the first modern fighter. The AP-4 was equipped with a Pratt & Whitney R-1830 radial engine enhanced by a supercharger. In March 1939, the Army ordered 13 of these AP-4 test models, designated YP-43. They were delivered in September 1940 as Republic P-43 Lancers. By 1941, new air combat technology had overtaken the Lancer's technology, and Republic's chief designer, Russian émigré Alexander Kartveli, began planning what would turn into the P-47 Thunderbolt. But since the engine that would power the P-47, Pratt & Whitney R-2800 Double Wasp, was not yet available, the U.S. Army Air Corps (USAAC) ordered some almost 2,000 P-43 Lancers to be used in the meantime. Another 108 went to the Chinese Air Force through the Lend-Lease program. None of the U.S. P-43s saw combat duty but served in a training, and later in a photoreconnaissance, role. The P-47 Thunderbolt that was on Kartveli's drawing board in 1940 is ranked as one of the three best fighters of World War II along with Lockheed's P-38 Lightning and North American's P-51 Mustang. The P-47 sported a massive fuselage, used the Pratt & Whitney R-2800 Double Wasp engine enhanced with a turbocharger, and was the heaviest single-engine fighter to fly in the war. The USAAC ordered the 171 prototype XP-47B in September 1940, and 773 planes more soon after. The plane was designed around the turbocharger from the start, which was situated in the rear fuselage to keep the plane balanced, and was connected to the engine by a long piece of ducting. It also had an unusual telescopic landing gear that allowed room for all the guns. The plane entered production in early 1942, and early in 1943 began service with Britain's Royal Air Force as escorts to the B-17 and B-24 bombers. The P-47s could also carry bombs, which turned the fighters into fighter-bombers with the P-47D "Juggernaut," the first large-scale production model. The Juggernaut version carried out strafing and bombing missions with deadly effect in the European and the Pacific theaters until the end of the war. The U.S. Army Air Forces (USAAF) ordered 850 in October 1941. (The Army Air Corps had been reorganized as the Army Air Forces.) Republic produced 12,602 P-47Ds, the largest number of a single sub-type of any fighter in history. Total P-47D production was 15,660. Production of the P-47 ended in November 1945. The company tried two other aircraft with little success. The Seabee amphibian incurred large losses after good initial sales. The F-12 reconnaissance aircraft was the fastest multiengine piston-powered aircraft ever flown. It was cancelled, however, and Republic transformed the design into the commercial 40-seat RC-2 Rainbow ordered by American and Pan Am airlines. It, too, was cancelled, and the company was left in precarious financial position. 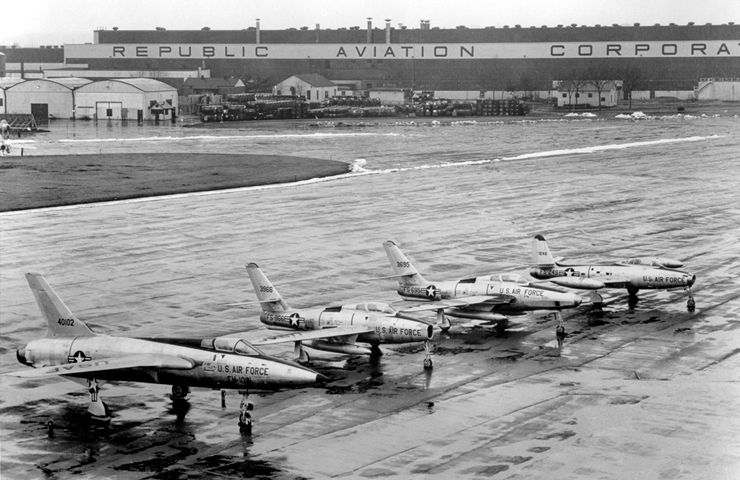 The new postwar P-84/F-84 jet fighter-bomber returned Republic to profitability. The company built three main varieties of this plane to replace the P-47. The first, the P-84 Thunderjet (changed to F-84 on June 11, 1948), first flew on February 28, 1946. It was the last of Republic's straight-wing jet designs. The Thunderjet was a high-performance aircraft, and briefly set an American speed record, flying at 611 miles per hour (983 kilometers per hour) in September 1946. It kept the record for one day, when a Gloster Meteor flying at 616 miles per hour (991 kilometers per hour) set a new record. The last in the Thunderjet series, the F-84G, could deploy nuclear weapons and was the first fighter capable of in-flight refueling. Used by American forces in Korea, by NATO troops, and by some nonaligned nations, approximately 4,450 Thunderjets were built between 1947 and 1953. The second F-84 was the swept-wing F-84F Thunderstreak. After several manufacturing delays and a switch to a more powerful engine, the first production F-84F flew in the fall of 1952. About 2,700 were built, with 1,300 going to NATO forces. The F-84F served with the Tactical Air Command (TAC) and with the Strategic Air Command (SAC). Those with the TAC were equipped to deliver nuclear weapons using the Low Altitude Bombing System (LABS). The strategy was for the F-84F to race toward the target at treetop level. When near the target, the F-84F would make a half loop upward, release its bomb, and then escape the nuclear blast with a rapid high-speed maneuver and head back from where it came. Fortunately, the Thunderstreak never had to carry out this mission in real combat. The RF-84F Thunderflash was the final F-84. It was the first of the modern jets to be designed specifically for photoreconnaissance and the first fighter-type plane to carry cameras that could take horizon-to-horizon pictures. Republic produced 715 of the aircraft. First flown in 1953 and used for many years, the plane was eventually withdrawn from service in 1971. At the same time that Republic was working on the F-84, Kartveli and his team were designing Republic's first swept-wing plane, a high-speed experimental interceptor designated the XF-91 Thunderceptor. Begun in 1946, it was America's first combat-type fighter to fly faster than the speed of sound. The plane used a variable-incidence wing that could be adjusted in flight for the most effective angle during takeoff, cruise, and landing. The plane first flew at Edwards Air Force Base on May 9, 1949. In December 1951, it became the first U.S. combat aircraft to go supersonic in level flight. The Thunderceptor never went into production because it could not carry fuel for flights lasting longer than 25 minutes and did not have the latest type of fire control system but it led to further developments in advanced fighter technology. In 1951, Republic began to develop a supersonic fighter-bomber to replace the F-84F. The F-105 Thunderchief, also nicknamed "Thud" (some say with affection and others say because the plane was too heavy), made its first flight on October 22, 1955, although the first production version, the F-105B, was not delivered until May 1958. This supersonic aircraft had an internal bomb bay, the first ever on a fighter aircraft, and was capable of deploying nuclear weapons. It was the heaviest and most complex fighter used by the Air Force to date. The F-105 exhibited the pinched-waist fuselage to conform to the new "area rule" concept for reduced aerodynamic drag at transonic speeds. The F-105D first flew in 1959 and was the main production version with more than 600 built. It was used extensively in Vietnam, flying 75 percent of the air strikes against North Vietnam during the first four years of the war and participating in "Operation Rolling Thunder," which began in March 1965. Featuring highly sophisticated electronics, its navigation system automatically supplied the pilot with current position coordinates, ground speed, distance to target, and other information. The F-105D was considered the first "black box" fighter and was the only aircraft that could penetrate the Soviet-provided air defense system protecting North Vietnam. The final production version was the F-105F, of which 86 were converted for "Wild Weasel" missions against North Vietnam beginning in 1967. Sixty F-105Fs were redesignated as F-105G and outfitted with greatly improved avionics. The sophisticated electronics on these planes were used to counter hostile radar-controlled surface-to-air weapons by jamming the enemy's radar. Thunderchiefs flew more than 20,000 combat missions in Vietnam. More than half of the planes built were lost in combat, not considered a bad record when considering the number of missions flown. The F-105 was Republic's last independent design. Republic attempted to diversify, establishing a helicopter division in December 1957 and building the French Alouette helicopter under license. It also introduced a turboprop airliner—the Rainbow—for short to medium-distance routes, but interest was light and the project ended. Republic acquired a minority interest in the Dutch aircraft firm Fokker and attempted to market an attack plane in 1960. None of these efforts was successful. Meanwhile, after acquiring Republic stock, the aerospace company Fairchild acquired Republic in July 1965. In September, Republic became the Republic Aviation Division of Fairchild Hiller, ending Republic's existence as an independent company. This excellent article was written by Judy Rumerman. Here is the orginal article!